Scapa occupies a unique and spectacular location, on what is called the Orkney Mainland, part of the Orkney Isles, an archipelago of 70 islands. Although remote, lying to the North of mainland Scotland, the Orkney Isles have a particularly rich and intriguing history, dating back to at least 5,000 BC. The Vikings arrived in Shetland and the Orkneys in the 8th and 9th centuries and ruled for the next 600 years. In 1468 the islands were effectively sold to James II of Scotland by the king of Denmark. Today the Orkney Isles encompass a wealth of historic sites from bronze age burial mound and villages to standing stones and ancient churches and a wealth of natural history. The origins of Scapa distillery date back to 1885; built by Macfarnale and Townsend, who seemed to have chosen the remote Orkney Islands for their distillery location, as opposed to somewhere in the then prevalent- Speyside, in their pursuit to produce a unique type of malt whisky. Scapa was eventually sold to Hiram Walker in 1954, but it was mothballed from 1994 until 2004. In 2005, the new owners, Pernod-Ricard, made the decision to re-furbish and restore the distillery to ensure its long-term survival. The refurbishment was focused on quality, and the distillery only produces for single malts and in small quantities. 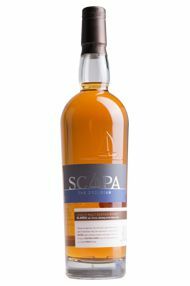 Whilst Scapa remains an island malt, geographically at least, its taste reminds nothing of the typical pungent phenolic/peaty character of other neighbouring island distilleries (e.g. Highland Park or Skyes Talisker). 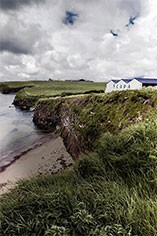 Scapa is decisively on the gentler side of the Orkney Isles and it is unique for an island whisky as its malted barley is entirely unpeated. This typically allows for a soft, malty, licorice-flavoured palate to come through, gently smoky with butterscotch on the tail.